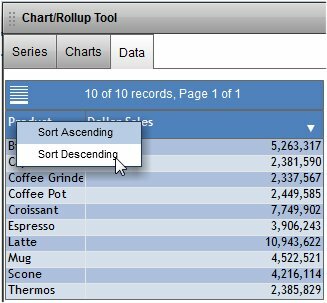 The Chart/Rollup Tool enables you to organize and summarize selected columns of data in order for you to obtain a desired report. The Chart/Rollup Tool contains a list of columns available in an active report, and Group By and Measure sort fields. You can click and drag the desired columns into the sort fields. Once you define the report, you can display the data as a chart or Rollup Table. Important: In order for you to generate all the charts described in this topic, your environment must have access to (or a connection to) a WebFOCUS Client hosted on a web server. When you are connected to a WebFOCUS Client, you are in connected mode. When you are not connected to a WebFOCUS Client (that is, when you are in disconnected mode), you can also generate certain charts. The supported charts in disconnected mode are the default bar, pie, line, and scatter charts. This topic provides step-by-step instructions for selecting and organizing the data that you want to include in a report. It also describes how to present the selected data in chart format, or in tabular format as a Rollup Table. Create an active report with an output format of either active report for Adobe Flash Player (FLEX) or active report for PDF (APDF). In any column heading, click the arrow to display a drop-down menu. From the menu, click Chart/Rollup Tool, as shown in the following image. 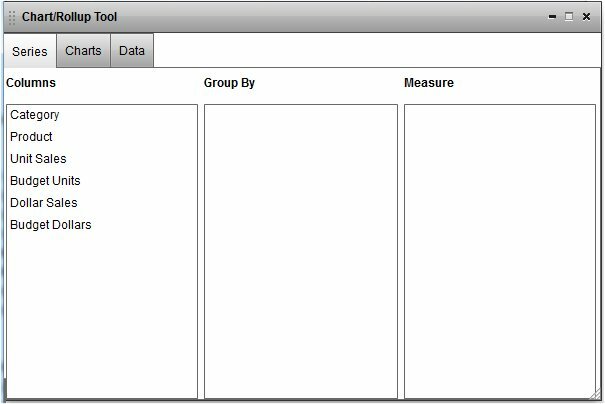 The Chart/Rollup Tool opens, with the Series tab displayed, as shown in the following image. The Series tab includes the Columns, Group By, and Measure lists. The Columns list includes all available columns in the active report. You can drag and drop columns from the Columns list into the Group By or Measure sort field. The Charts tab allows you to select the desired chart type. The Data tab displays the result of your report design as a Rollup Table. Left-click and drag the desired columns from the Columns list into the Group By and Measure sort fields. You can edit the sort fields by clicking the X icon to delete columns, drag multiple columns into the Group By and Measure sort fields, reorder the columns in the sort fields, and change the aggregation type of the Measure by clicking the Calculation icon. The following image shows a report that has been designed on the Series tab. WebFOCUS automatically generates a new window that contains a pie chart when there is more than one field in the Group By and Measure sort fields. To change the chart type, click the Charts tab and then click the chart type of your choosing (Bar, Pie, Line, Scatter, or Other), as shown in the following image. Only the four default charts (pie, bar, line, and scatter) are available on the Charts tab if you are running an active report or an active dashboard for PDF. When you point to a chart label, the complete descriptive name of the chart is provided. The chart type in the output window dynamically changes to the chart type selected. The chart image in the tool window is highlighted to indicate the chart type selected and displayed in the output window. The following image shows an output window with the selected data presented as a pie chart. Click the close button, X, in the upper-right corner of the Chart/Rollup Tool to exit the tool. From the output window, you can change the chart format to one of the available types. The Column icon changes the type to the default column chart. The Pie icon changes the type to the default pie chart. The Line icon changes the type to the default line chart. The Scatter icon changes the type to the default scatter chart. You can click the Rollup icon to display the data in tabular (grid) format. You can click the Advanced Chart icon to return to the Series tab in the Chart/Rollup Tool. You can click the Lock/Unlock icon to lock (freeze) the report. You can click the Original Chart icon to restore the current chart type to the initial chart type that was displayed. You can click the Aggregation icon to change the aggregation type. You can click the Menu icon, and click Chart/Rollup Tool, to open the Chart/Rollup Tool again. To display the result of your chart design as a Rollup Table, open the Chart/Rollup Tool and click the Data tab. The selected data is displayed in tabular format. Click the arrow on a column heading to display a menu of your data sort options, as shown in the following image. From the Data tab, you can return to the Series or Charts tab. You can use multiple Group By and Measure sort fields. Group By is the column used for the X-axis, and Measure is the column used for the Y-axis. You can use only one Measure sort field (as the Y-axis) when using a pie chart. The same column can appear in both the Group By and Measure sort fields. You can drag columns between the Group By and Measure sort fields, but you cannot drag them back to the Columns section. Headings for the chart are generated using the field name, or column title name. The report HEADING is inherited only if REPORT-VIEW=CHART is set in the WebFOCUS procedure. When you use the Chart/Rollup Tool with hidden columns (HIDE=ON StyleSheet setting), the hidden columns will not be displayed in the Rollup Table. To display the hidden columns in the Rollup Table, select Show Columns from the active report menu, and select the column name that you want to display. A chart often conveys meaning more clearly and effectively than data displayed in tabular form. A chart enables you to visually communicate quantitative information. On a chart, you can give data a shape and form, and reveal patterns and relationships among many data values. It is important that you select a chart type that is appropriate for your data. The Chart/Rollup Tool provides a complete chart type library, which includes advanced chart types, as well as basic types. You can select from a wide variety of chart types to best represent the data that you want to display. The Charts and Pie tabs on the Chart/Rollup Tool are shown in the following image. The following are the chart types that you can select. Bar charts. Bar charts plot numerical data by displaying rectangular blocks against a scale (numbers or variable measures that appear along the axis). The length of a bar corresponds to a value or amount. You can clearly compare data series (fields) by the relative heights of the bars. 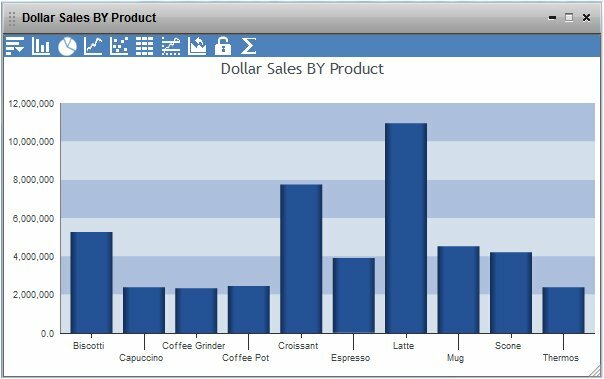 Use a bar chart to display the distribution of numerical data. You can create horizontal as well as vertical bar charts. For a complete list of available bar chart types, see Bar Chart Types. The following is an example of a basic bar chart. Pie charts. Pie charts emphasize where your data fits, in relation to a larger whole. Pie charts work best when the data consists of several large segments. Too many variables divide the pie into small segments that are difficult to see. Use color on individual segments to create visual contrast. For a complete list of available pie chart types, see Pie Chart Types. The following is an example of a basic pie chart. Line charts. Line charts are useful for emphasizing the movement or trend of numerical data over time. They allow you to trace the evolution of a data point by working backward or interpolating. Highs and lows, rapid or slow movement, or a tendency towards stability are all types of trends well suited to a line chart. You can also plot line charts with two or more scales to present a comparison of the same value, or set of values, in different time periods. For a complete list of available line chart types, see Line Chart Types. The following is an example of a basic line chart. Scatter. 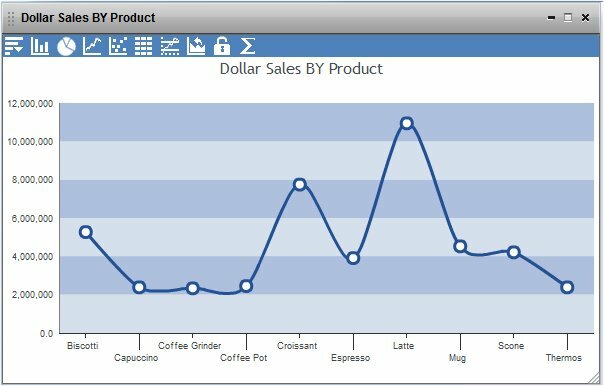 Scatter charts share many of the characteristics of basic line charts. You can plot data using variable scales on both axes. When you use a scatter chart, the data is plotted with a basic line pattern so that you can visualize the density of individual data values around particular points, or discern patterns in the data. A numeric X-axis, or sort field, always yields a scatter chart by default. Scatter charts and line charts are distinguishable from one another only by virtue of their X-axis format. Line charts can appear without connecting lines, making them look like scatter charts, and scatter charts can appear with connecting lines, making them look like line charts. 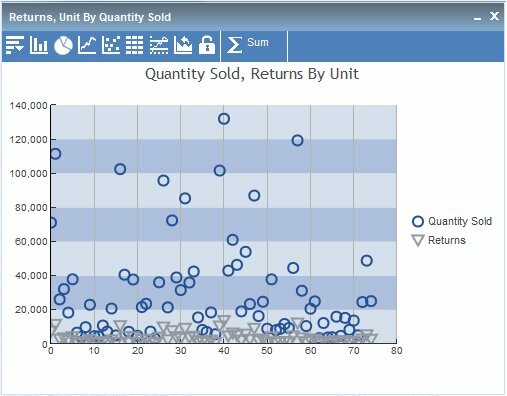 For a complete list of scatter chart types, see Scatter Chart Types. The following is an example of a basic scatter chart. Funnel. A funnel chart depicts data that is equal to 100 percent when the total is calculated. Each data slice in a funnel chart is displayed as a portion of 100 percent. A funnel chart is a single-series chart. On a stream line funnel chart, each slice in the funnel depicts a process flow that has filtered the data. Data points are arranged in descending order, based on their cumulative percentage value. Like a funnel chart, a stream line funnel chart is a single-series chart. Pyramid. The data sets for a pyramid chart and funnel chart are basically the same. However, a pyramid chart depicts data in a different way than a funnel chart. The data slices on a pyramid chart represent increasing proportions of a whole. WebFOCUS determines the size of a slice on a pyramid chart by the series value when calculated as a percentage of the total of all values. There is no stream line option for a pyramid chart. Radar. A radar chart compares two or more data sets. You can use axes or polygons to represent values in a star or spider configuration. Radar charts are essentially analogous to line charts, except that the scale wraps around. Radar charts work well with data that is cyclical, such as the months of a year. This topic contains reference tables which list the chart types that are supported by Active Technologies for Adobe Flash Player and for PDF. As noted in the tables, the default chart types (bar, pie, line, and scatter) are available for both active report/active dashboard for Adobe Flash Player and active report/active dashboard for PDF. You can use the default chart types when you are not connected to a WebFOCUS Client (that is, when you are in disconnected mode). The non-default chart types are available only for active report/active dashboard for Adobe Flash Player. You must have access to a WebFOCUS Client in order to use the non-default chart types. Default Active Technologies bar chart for Adobe Flash Player. Available for both active report/active dashboard for Adobe Flash Player and active report/active dashboard for PDF. Can be used in disconnected mode. The following bar chart types and column chart types are available for active report/active dashboard for Adobe Flash Player. To use these charts, you must have access to a WebFOCUS Client. Default Active Technologies pie chart for Adobe Flash Player. Available for both active report/active dashboard for Adobe Flash Player and active report/active dashboard for PDF. Can be used in disconnected mode. 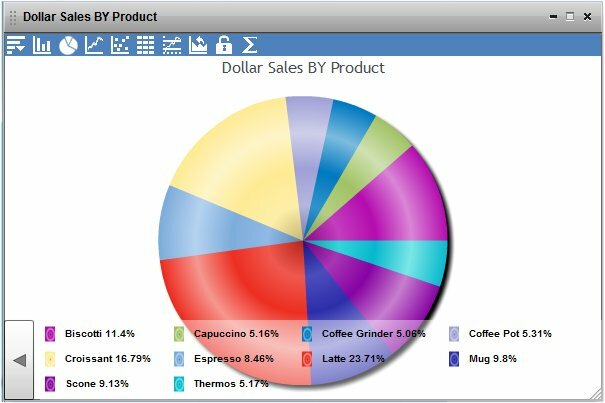 The following pie chart types and doughnut chart types are available for active report/active dashboard for Adobe Flash Player. To use these charts, you must have access to a WebFOCUS Client. Default Active Technologies line chart for Adobe Flash Player. Available for both active report/active dashboard for Adobe Flash Player and active report/active dashboard for PDF. Can be used in disconnected mode. The following line chart types and area chart types are available for active report/active dashboard for Adobe Flash Player. To use these charts, you must have access to a WebFOCUS Client. Default Active Technologies scatter chart for Adobe Flash Player. Available for both active report/active dashboard for Adobe Flash Player and active report/active dashboard for PDF. Can be used in disconnected mode. 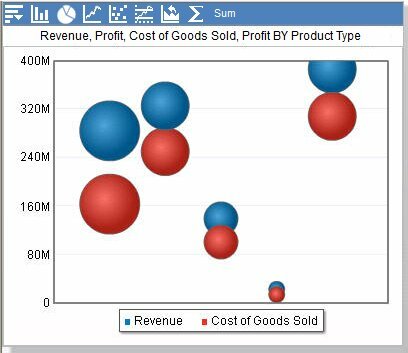 The following scatter chart types and bubble chart types are available for active report/active dashboard for Adobe Flash Player. To use these charts, you must have access to a WebFOCUS Client. The following charts are available for active report/active dashboard for Adobe Flash Player. To use these charts, you must have access to a WebFOCUS Client. When you create a bubble chart, you must include a pair of columns for each series on the chart. The value of the first column in a pair of columns determines the position of each bubble in the series. The value of the second column in the pair of columns determines the size of each bubble in the series. For example, consider the following sample code. As written, the code creates a single-series bubble chart. The pair of columns for the series includes LINEPRICE and PROFIT. WebFOCUS uses the value of LINEPRICE to position each bubble in the series, and the value of PROFIT to size each bubble in the series. To add another series to the sample bubble chart, you must include a pair of columns for that series also, as shown in the following code. The pair of columns for the second series includes COSTOFGOODSSOLD and PROFIT. WebFOCUS uses the value of COSTOFGOODSSOLD to position each bubble in the second series, and the value of PROFIT to size each bubble in the second series. When the sample bubble chart is run, the bubbles in each series are positioned and sized correctly, as shown in the following image. The first bubble series (Revenue) is displayed in blue, and the second bubble series (Cost of Goods Sold) is displayed in red. For every new series that you add to the chart, you must include a pair of columns. If you do not specify a pair of columns for a series, WebFOCUS sets the size of each bubble in the series to 1.